It speaks well of Republicans that most of them have no use for Donald Trump. The real-estate mogul and reality-TV personality proclaimed himself a presidential candidate on Tuesday, with a bizarre and rambling announcement in the lobby of the Trump Tower in Manhattan that drove the needle on the crazy-meter way into the red zone. 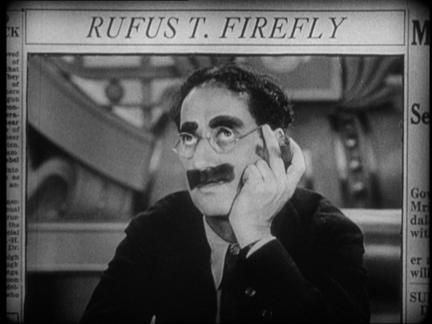 I used to think that Trump was about as plausible a GOP candidate as Rufus T. Firefly. I realize now that I owe Firefly an apology. Heading into last week's event, Trump had already established himself as the GOP's most unpopular candidate  the first candidate in modern presidential primary history, as political analyst Harry Enten remarked, to begin a White House run with a majority of his own party against him. Averaging together the three most recent national polls, Enten calculates that a staggering 57 percent of Republicans have an unfavorable view of Trump. In a Fox News survey this month, 59 percent of likely Republican voters said Trump was a candidate they would "never vote for." Who can blame them? Virtually nothing Trump says is worth hearing. The opinions he expresses on public issues are the byproduct of his egotistical self-promotion  the clownish rantings of a publicity-seeker, not the governing philosophy of a potential commander-in-chief. Trump isn't a legitimate candidate, he is, to borrow George Will's phrase, a "bloviating ignoramus." Granted, he has a knack for making money and drawing attention. So does Kim Kardashian. Voters aren't going to elect her president, either. News organizations are under no obligation to provide a platform to every narcissistic buffoon who declares himself a candidate for the White House. It's probably futile to expect the networks hosting the Republican primary debates to exclude a ratings magnet like Trump, but they should. His presence on the stage will be degrading to everyone in the room. Even if the other contenders run rings around Trump on substance, his insults and idiocies will stain them all by association. Do the GOP's serious candidates really want to share the spotlight with a loudmouth who spent much of the last presidential election cycle trafficking in "birther" theories? Trump repeatedly questioned whether Barack Obama was born in the United States, and offered to pay $5 million if the president would disclose his college-application records. When Obama's birth certificate from Hawaii was released, not only did Trump betray no twinge of self-reproach, he sang his own praises even more loudly. "A lot of people love me for it," he crowed to reporters last year. "I got him to produce his so-called birth certificate, or whatever it was." Trump isn't just a conspiracy-mongering blowhard. He is also a crude nativist. "The US has become a dumping ground for everybody else's problems," he said on Tuesday. "When Mexico sends its people, they're ... sending people that have lots of problems.... They're bringing drugs. They're bringing crime. They're rapists." And Trump's proposed solution to this invasion of drug-addled Mexican rapists? "I would build a great wall, and nobody builds walls better than me," he spouted. "I'll build them very inexpensively. I will build a great, great wall on our southern border. And I will have Mexico pay for that wall." There may be an audience for that sort of incoherent demagoguery in the more fetid xenophobic fever-swamps. But there is none whatsoever among Republicans seeking to enlarge their party with an Reaganesque message of optimism, freedom, and growth. Indeed, Trump is so far from being a mainstream Reagan-style conservative that the real question is why he is bringing his circus to the GOP tent in the first place. Almost anyone would make a better presidential candidate than Donald Trump. He has touted a single-payer health care system on the Canadian model. He has advocated a wealth tax on individuals and trusts with a net worth of at least $10 million. He has called for a 25 percent tariff on all Chinese exports. He has praised the Supreme Court's notorious Kelo decision, which upheld the power of the state to condemn private homes through eminent domain, so it can turn the land over to influential developers  like Trump. With such a government-enlarging, tax-raising, trade-restricting outlook, one might have expected Trump to be more comfortable as a champion of the Democratic Party. Sure enough, he has been a major backer of Democratic candidates, pouring hundreds of thousands of dollars into Democratic campaigns over the years. In the 2006 election cycle, for example, Trump donated heavily to Democratic committees focused on regaining control of Congress  an effort that culminated with Harry Reid becoming Senate majority leader and Nancy Pelosi rising to speaker of the House. Trump isn't a conservative, he isn't a Republican, and he isn't a presidential candidate. He is a political punch line looking for a joke. All things considered, I prefer Rufus T. Firefly.